Obsidian is produced when felsic lava extruded from a volcano cools rapidly with minimal crystal growth. It is commonly found within the margins of rhyolitic lava flows known as obsidian flows, where the chemical composition (high silica content) causes a high viscosity which, upon rapid cooling, forms a natural glass from the lava. The inhibition of atomic diffusion through this highly viscous lava explains the lack of crystal growth. Obsidian is hard, brittle, and amorphous; it therefore fractures with very sharp edges. In the past it was used to manufacture cutting and piercing tools and it has been used experimentally as surgical scalpel blades. ... among the various forms of glass we may reckon Obsidian glass, a substance very similar to the stone found by Obsidius[i] in Ethiopia. The translation into English of Natural History written by Pliny the Elder of Rome shows a few sentences on the subject of a volcanic glass called obsidian (lapis obsidianus), discovered in Ethiopia by Obsidius, a Roman explorer. Obsidian is the rock formed as a result of quickly cooled lava, which is the parent material. Extrusive formation of obsidian may occur when felsic lava cools rapidly at the edges of a felsic lava flow or volcanic dome or when lava cools during sudden contact with water or air. Intrusive formation of obsidian may occur when felsic lava cools along the edges of a dike. Tektites were once thought by many to be obsidian produced by lunar volcanic eruptions, though few scientists now adhere to this hypothesis. Obsidian is mineral-like, but not a true mineral because as a glass it is not crystalline; in addition, its composition is too variable to be classified as a mineral. It is sometimes classified as a mineraloid. Though obsidian is usually dark in color, similar to mafic rocks such as basalt, obsidian's composition is extremely felsic. Obsidian consists mainly of SiO2 (silicon dioxide), usually 70% or more. Crystalline rocks with obsidian's composition include granite and rhyolite. Because obsidian is metastable at the Earth's surface (over time the glass becomes fine-grained mineral crystals), no obsidian has been found that is older than Cretaceous age. This breakdown of obsidian is accelerated by the presence of water. Having a low water content when newly formed, typically less than 1% water by weight, obsidian becomes progressively hydrated when exposed to groundwater, forming perlite. Pure obsidian is usually dark in appearance, though the color varies depending on the presence of impurities. 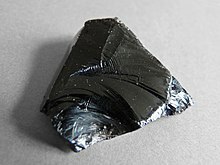 Iron and other transition elements may give the obsidian a dark brown to black color. Very few samples are nearly colorless. In some stones, the inclusion of small, white, radially clustered crystals spherulites of the mineral cristobalite in the black glass produce a blotchy or snowflake pattern (snowflake obsidian). Obsidian may contain patterns of gas bubbles remaining from the lava flow, aligned along layers created as the molten rock was flowing before being cooled. These bubbles can produce interesting effects such as a golden sheen (sheen obsidian). An iridescent, rainbow-like sheen (rainbow obsidian) is caused by inclusions of magnetite nanoparticles. There are only four major deposit areas in the central Mediterranean: Lipari, Pantelleria, Palmarola and Monte Arci. Ancient sources in the Aegean were Milos and Gyali. Acıgöl town and the Göllü Dağ volcano were the most important sources in central Anatolia, one of the more important source areas in the prehistoric Near East. The first known archaeological evidence of usage was in Kariandusi and other sites of the Acheulian age (beginning 1.5 million years BP) dated 700,000 BC, although the number of objects found at these sites were very low relative to the Neolithic. Use of obsidian in pottery of the Neolithic in the area around Lipari was found to be significantly less at a distance representing two weeks journeying. Anatolian sources of obsidian are known to have been the material used in the Levant and modern-day Iraqi Kurdistan from a time beginning sometime about 12,500 BC. The first attested civilized use is dated to the late fifth millennium BC, known from excavations at Tell Brak. Obsidian was valued in Stone Age cultures because, like flint, it could be fractured to produce sharp blades or arrowheads. Like all glass and some other types of naturally occurring rocks, obsidian breaks with a characteristic conchoidal fracture. It was also polished to create early mirrors. Modern archaeologists have developed a relative dating system, obsidian hydration dating, to calculate the age of obsidian artifacts. 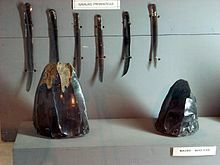 In the Ubaid in the 5th millennium BC, blades were manufactured from obsidian extracted from outcrops located in modern-day Turkey. Ancient Egyptians used obsidian imported from the eastern Mediterranean and southern Red Sea regions. Obsidian was also used in ritual circumcisions because of its deftness and sharpness. [not in citation given] In the eastern Mediterranean area the material was used to make tools, mirrors and decorative objects. Obsidian has also been found in Gilat, a site in the western Negev in Israel. Eight obsidian artifacts dating to the Chalcolithic Age found at this site were traced to obsidian sources in Anatolia. Neutron activation analysis (NAA) on the obsidian found at this site helped to reveal trade routes and exchange networks previously unknown. Obsidian worked into plates and other wares by Victor Lopez Pelcastre of Nopalillo, Epazoyucan, Hidalgo. On display at the Museo de Arte Popular, Mexico City. 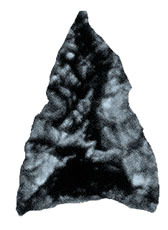 Lithic analysis can be instrumental in understanding prehispanic groups in Mesoamerica. A careful analysis of obsidian in a culture or place can be of considerable use to reconstruct commerce, production, distribution and thereby understand economic, social and political aspects of a civilization. This is the case in Yaxchilán, a Maya city where even warfare implications have been studied linked with obsidian use and its debris. Another example is the archeological recovery at coastal Chumash sites in California indicating considerable trade with the distant site of Casa Diablo, California in the Sierra Nevada Mountains. Pre-Columbian Mesoamericans' use of obsidian was extensive and sophisticated; including carved and worked obsidian for tools and decorative objects. Mesoamericans also made a type of sword with obsidian blades mounted in a wooden body. Called a macuahuitl, the weapon was capable of inflicting terrible injuries, combining the sharp cutting edge of an obsidian blade with the ragged cut of a serrated weapon. The pole arm version of this weapon was called tepoztopilli. Obsidian imported from Milos, found in Minoan Crete. Native American people traded obsidian throughout the Americas. Each volcano and in some cases each volcanic eruption produces a distinguishable type of obsidian, making it possible for archaeologists to trace the origins of a particular artifact. Similar tracing techniques have allowed obsidian to be identified in Greece also as coming from Milos, Nisyros or Gyali, islands in the Aegean Sea. Obsidian cores and blades were traded great distances inland from the coast. In Chile obsidian tools from Chaitén Volcano have been found as far away as in Chan-Chan 400 km (250 mi) north of the volcano and also in sites 400 km south of it. Obsidian was also used on Rapa Nui (Easter Island) for edged tools such as Mataia and the pupils of the eyes of their Moai (statues), which were encircled by rings of bird bone. Obsidian was used to inscribe the Rongorongo glyphs. Obsidian can be used to make extremely sharp knives, and obsidian blades are a type of glass knife made using naturally occurring obsidian instead of manufactured glass. 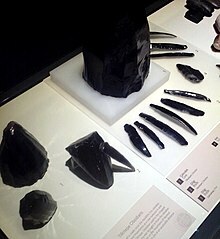 Obsidian is used by some surgeons for scalpel blades, although this is not approved by the US Food and Drug Administration (FDA) for use on humans. Well-crafted obsidian blades, as with any glass knife, can have a cutting edge many times sharper than high-quality steel surgical scalpels, the cutting edge of the blade being only about 3 nanometers thick. Even the sharpest metal knife has a jagged, irregular blade when viewed under a strong enough microscope; when examined even under an electron microscope an obsidian blade is still smooth and even. One study found that obsidian incisions produced fewer inflammatory cells and less granulation tissue at seven days, in a group of rats, although no differences were found after 21 days. Don Crabtree produced obsidian blades for surgery and other purposes, and has written articles on the subject. Obsidian scalpels may currently be purchased for surgical use on research animals. Obsidian is also used for ornamental purposes and as a gemstone. It presents a different appearance depending on how it is cut: in one direction it is jet black, while in another it is glistening gray. "Apache tears" are small rounded obsidian nuggets often embedded within a grayish-white perlite matrix. Plinths for audio turntables have been made of obsidian since the 1970s; e.g. the grayish-black SH-10B3 plinth by Technics. Yaxchilan Lintel 24 – Ancient carving showing a Maya bloodlet ritual involving a rope with obsidian shards. ^ In Bostock's original translation, the name is given as Obsius, based on an emendation by Sillig of the older reading Obaidius in Pliny. There was a minor Roman family with the nomen Opsius or Obsius, which Sillig substituted for the unfamiliar Obsidius, a much less common name. ^ Peter Roger Stuart Moorey (1999). Ancient mesopotamian materials and industries: the archaeological evidence. Eisenbrauns. pp. 108–. ISBN 978-1-57506-042-2. ^ Geological Survey (U.S.) (1981). Geological Survey (U.S.). The Survey. pp. 185–. ^ John P. Rafferty (August 2011). Rocks. The Rosen Publishing Group. pp. 97–. ISBN 978-1-61530-492-9. ^ I-science I' 2006 Ed. Rex Bookstore, Inc. pp. 127–. ISBN 978-971-23-4399-5. ^ Brian Cotterell; Johan Kamminga (1992). Mechanics of pre-industrial technology: an introduction to the mechanics of ancient and traditional material culture. Cambridge University Press. pp. 127–. ISBN 978-0-521-42871-2. Retrieved 9 September 2011. ^ Pliny the Elder (translated by John Bostock, Henry Thomas Riley) (1857). The natural history of Pliny. 6. H G Bohn. ISBN 978-1851099306. ^ Dictionary of Greek and Roman Biography and Mythology, vol. III, p. 2 ("Obsidius"). ^ obsidian. The Concise Oxford Dictionary of English Etymology. Oxford University Press (1996). Retrieved 2011-11-20. ^ M H Manser. The Facts On File Dictionary of Allusions. Infobase Publishing, 2008, ISBN 0816071055. ^ P L Barnes-Svarney; T E Svarney (2004). The Handy Geology Answer Book. Visible Ink Press. ISBN 978-1578591565. ^ M Martini; M Milazzo; M Piacentini; Società Italiana di Fisica (2004). Physics Methods in Archaeometry. 154. IOS Press. ISBN 978-1586034245. ^ Scientific American, vol. 239, p.116. Munn & Company. 1978. ^ Melissa L. Sevigny (25 February 2016). Under Desert Skies: How Tucson Mapped the Way to the Moon and Planets. University of Arizona Press. pp. 93–. ISBN 978-1-941451-04-5. ^ "Perlite – Mineral Deposit Profiles". B.C. Geological Survey. Archived from the original on 2008-05-09. Retrieved 2007-11-20. ^ Nadin, E. (2007). "The secret lives of minerals" (PDF). Engineering & Science (1): 10–20. ^ Bonetti, R.; Di Cesare, P.; Guglielmetti, A.; Malerba, F.; Migliorini, E.; Oddone, M.; Bird, J. R.; Torrence, R.; Bultitude, R. J. (25 November 1998). "Fission track dating of obsidian source samples from the Willaumez Peninsula, Papua New Guinea and eastern Australia". Records of the Australian Museum. 50 (3): 277–84. doi:10.3853/j.0067-1975.50.1998.1286. ^ Washington Obsidian Source Map Archived 2015-08-21 at the Wayback Machine. Obsidianlab.com. Retrieved on 2011-11-20. ^ Oregon Obsidian Sources. Sourcecatalog.com (2011-11-15). Retrieved on 2011-11-20. ^ Iain Morley and Colin Renfrew. The Archaeology of Measurement: Comprehending Heaven, Earth and Time in Ancient Societies, Cambridge University Press, 2010 ISBN 0521119901. ^ a b E Blake; A B Knapp (2005). The Archaeology Of Mediterranean Prehistory. John Wiley & Sons. ISBN 978-0631232681. ^ Prince Mikasa no Miya Takahito. Essays on Anatolian Archaeology, Otto Harrassowitz Verlag, 1993 ISBN 3447033959. ^ L Romano. 6 ICAANE, Otto Harrassowitz Verlag, 2010 Volume 3 of Proceedings of the 6th International Congress of the Archaeology of the Ancient Near East: 5–10 May 2009 ISBN 3447062177. ^ P R S Moorey. Ancient Mesopotamian Materials and Industries: The Archaeological Evidence Eisenbrauns, 1999 ISBN 1575060426. ^ S Bunny. Ancient trade routes for obsidian. New Scientist (1985-04-18). ^ A. M. Pollard; Carl Heron (2008). Archaeological Chemistry. Royal Society of Chemistry. ISBN 978-0854042623. ^ Oates, J.; McMahon, A.; Karsgaard, P.; Quntar, S. A.; Ur, J. (2 January 2015). "Early Mesopotamian urbanism: a new view from the north" (PDF). Antiquity. 81 (313): 585–600. doi:10.1017/S0003598X00095600. ^ John Noble Wilford (2010-04-05). "In Syria, a Prologue for Cities". The New York Times. ^ Harrell, James A. (2000). "Stone in Ancient Egypt". University of Toledo. ^ George Robert Rapp (2002). Archaeomineralogy. Springer. ISBN 978-3540425793. ^ Yellin, Joseph; Levy, Thomas E.; Rowan, Yorke M. (1996). "New Evidence on Prehistoric Trade Routes: The Obsidian Evidence from Gilat, Israel". Journal of Field Archaeology. 23 (3): 361–68. doi:10.1179/009346996791973873. ^ C. Michael Hogan (2008). Morro Creek, A. Burnham (ed.). Megalithic.co.uk. Retrieved on 2011-11-20. ^ Stark, Barbara L.; Boxt, Matthew A.; Gasco, Janine; González Lauck, Rebecca B.; Hedgepeth Balkin, Jessica D.; Joyce, Arthur A.; King, Stacie M.; Knight, Charles L. F.; Kruger, Robert (2016-03-01). "Economic growth in Mesoamerica: Obsidian consumption in the coastal lowlands". Journal of Anthropological Archaeology. 41: 263–282. doi:10.1016/j.jaa.2016.01.008. ISSN 0278-4165. ^ Mario Pino Quivido & Rayen Navarro (2005). "Geoarqueología del sitio arcaico Chan-Chan 18, costa de Valdivia: Discriminación de ambientes de ocupación humana y su relación con la transgresión marina del Holoceno Medio". Revista Geológica de Chile. 32. doi:10.4067/S0716-02082005000100004. ^ Naranjo, José A; Stern, Charles R (2004). "Holocene tephrochronology of the southernmost part (42°30'–45°S) of the Andean Southern Volcanic Zone". Revista Geológica de Chile. 31 (2): 225–40. doi:10.4067/S0716-02082004000200003. OCLC 61022562. ^ Eric Kjellgren; JoAnne Van Tilburg; Adrienne Lois Kaeppler (2001). Splendid Isolation: Art of Easter Island. Metropolitan Museum of Art. pp. 39–. ISBN 978-1-58839-011-0. ^ a b Buck, BA (March 1982). "Ancient Technology in Contemporary Surgery". The Western Journal of Medicine. 136 (3): 265–269. PMC 1273673. PMID 7046256. ^ Haviland, W.A. ; Prins H.E.L. ; Walrath D.; McBride B. (2010). Anthropology: The Human Challenge (13 ed.). Cengage Learning. p. 196. ISBN 9780495810841. Retrieved 27 September 2012. ^ Disa, J. J.; Vossoughi, J.; Goldberg, N. H. (October 1993). "A comparison of obsidian and surgical steel scalpel wound healing in rats". Plastic and Reconstructive Surgery. 92 (5): 884–887. doi:10.1097/00006534-199392050-00015. PMID 8415970. ^ Fine Science Tools (FST). "FST product catalog". FST. Retrieved 7 September 2012. ^ Manutchehr-Danai, Mohsen (2013-03-09). Dictionary of Gems and Gemology. Springer Science & Business Media. ISBN 9783662042885.